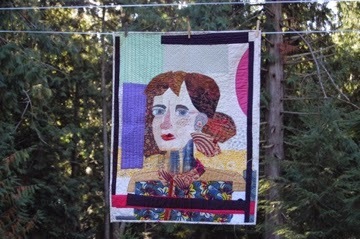 Barb Mortell is a textile artist who has been making colourful original quilts for over twenty years. I was tagged in this blog relay by Colleen Kole and Sharon Robinson. I met Colleen at Nancy Crow's teaching Barn in Ohio when I went on an extravagant 2 week class there. Colleen and I had never met, but in the interest of saving a few bucks, and of meeting new people, we became roommates. I have to say, the two weeks were much richer for it, and I feel I have a lifelong friend in Colleen. Our time there was also shared with Maria Shell who travelled back and forth to class with us in Colleen's car - and we three bonded in a way that people bond through intense experiences. Many morning coffees and car rides were filled with conversation, lots of laughter, some tears and plenty of talk about art. One day I hope to reunite with those two, somewhere in this big wide world, and I think it would be great it if Sharon Robinson were there too. I met Sharon at a class with Nancy Crow, a little closer to home in Washington state. Sharon is wicked smart with an excellent sense of humour and irony, and was my classroom neighbour for two weeks, in yet another intense learning experience with a bunch of cutters and piecers who just want to learn the goods from our favourite teacher. 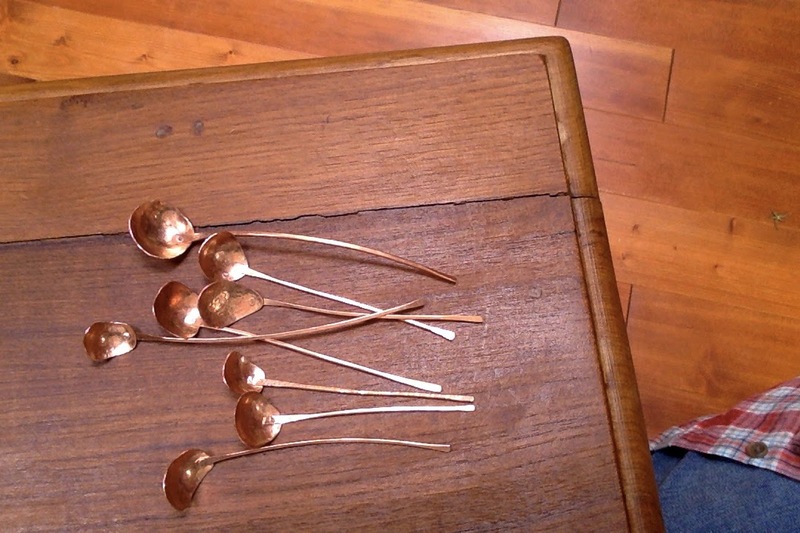 I’m making spoons! I’m a (temporarily) lapsed quilt maker who cuts and hammers and polishes metal. I woke up one morning and said “I’m going to make spoons!” Honestly, I don’t know where the drive to hammer out spoons came from, but I am loving the contrast of making small shiny things that I can complete in under an hour to working on large soft things that sometimes take weeks to finish. I will get back to quilt making in the new year, and with some fresh interest. The spoon making has freed up some part of my creativity that was trapped and sticky and keeping me from working freely and joyously, so I have discovered that my inability to stick with one thing has actually paid off. Another life lesson. 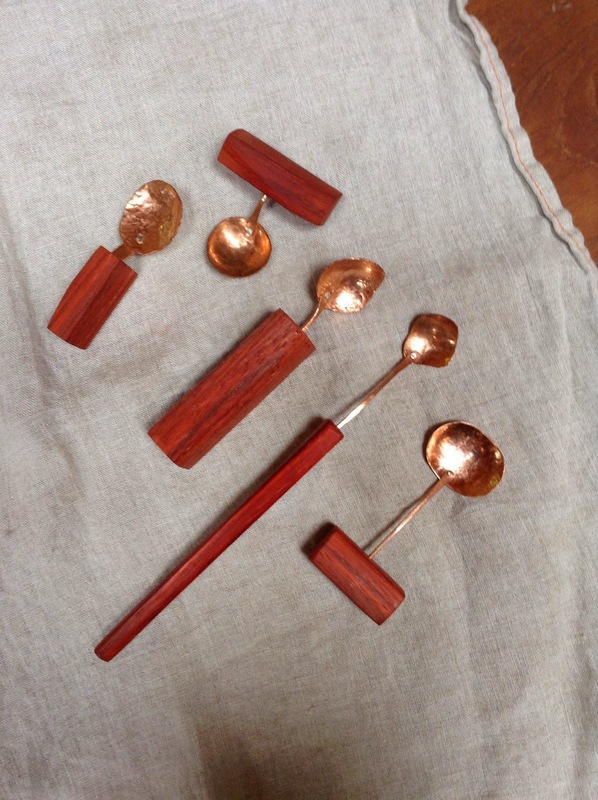 Its difficult to talk about where I fit in in the world of spoon making, because I haven’t really looked around to see whats happening there. I learned a few techniques and went in to full on production mode to make enough inventory for a couple of Craft Fairs that I was in, and I haven’t had much time for research. This is a "selfie" I made as a distraction from a project that was getting hard. I just free cut shapes with scissors and pinned them onto a pieced background. Then I layered the backing and batting and stitched all the bits down with machine quilting. I make quilts because I am a "blankie" person. I think some kids just love their blankies, some kids don't, and I was one of those kids who did. I used to drag my blankie around with me wherever I went, sometimes dragging my grandma’s cat along for the ride. I have fond memories of textiles in my life, like a plaid polished cotton windbreaker and a gold woollen dress with a built-in checked tie at the neck. I have very distinct recollections of the feel of these fabrics. I made my first quilt in the late 6o’s out of alternating red and blue bandannas, with a chambray denim backing. When I first discovered quilt making, it was like revisiting those memories, I would hunt out fabrics that had a certain feel or drape or vintage colour or print. I loved to mix the prints and patterns. I feel like I was born to sew, but never really liked making clothes. I love colour and I love to draw, I love to make things, I used to weave and paint, and combining all these things into making quilts just seemed natural for me. Well, I don't work any one way. I really fly by the seat of my pants, and my quilts may not have a consistent look because of it. When I use prints, I think my process is more loose, its easier for me. This one was done years ago and is a sampler of improvisational, pattern-breaking techniques. I was given a task here - a packet of fabrics and the theme of hearts - this single block was made for a friend's quilt. I added the flash of pink and drew up a paper-piecing pattern to do the branches in the heart, then I appliqued it and pieced a few bits. This was inspired by some beautiful red woollen cloth and the simple colour scheme of red and blue. I just cut big blocks and fit them together, then tied the quilt with red wool ties. I mostly use solid colours now in my quilts because they allow me to create line and shape in a pure sort of way. I try to create good shapes and put them in combination with other good shapes. Colour, scale, shape, line - all play a part in my trying to make a good composition. It seems simple when I start out, but I dive deep into the details and struggle around in there and hope to come out the other side with something good and different and worth looking at. 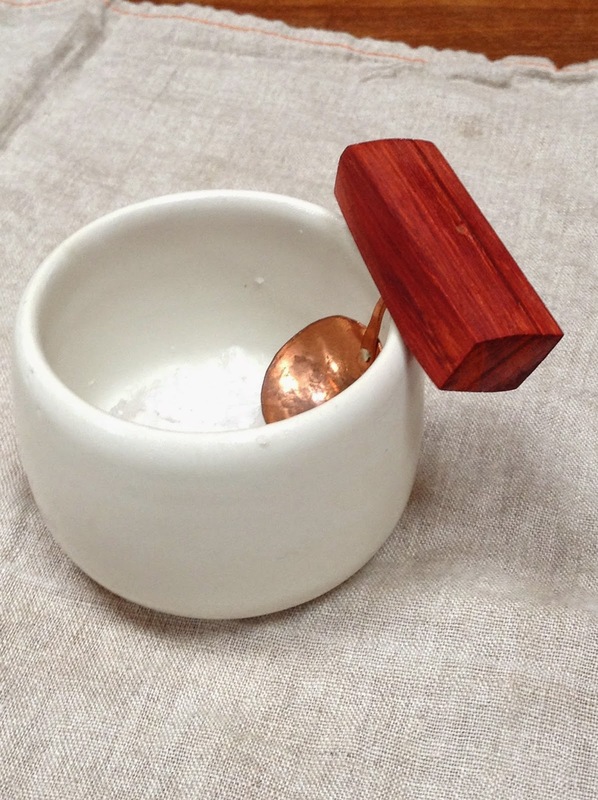 With the spoon thing - I am creating these little things just because I like a nice object. I am drawing in three dimensions - once again working from the gut, or from the heart, cutting shapes that please me at the moment and bending up a handle like drawing in the air. 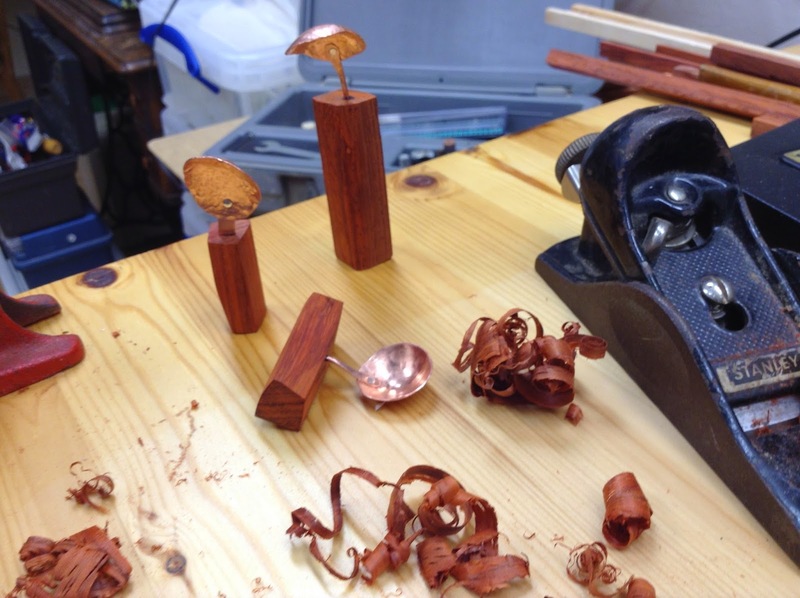 I make the bowl of the spoon, then I decide how the handle should be, looking for good proportions. Then I rivet the two together, polish it up and that's it. If I make a wooden handle, once again I am thinking of scale and proportion, and I shape the wood just by my intuition. 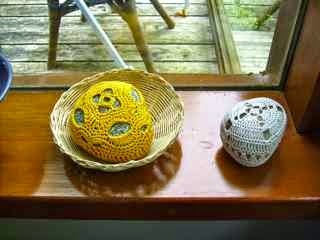 is a wonderful neighbour and friend and prolific maker of beautiful textile arts. She has a feel for the cloth and is a master of stitch. One of the rocks in my collection of rocks comes from Jean. a very funny and talented photographer and modern quilt maker. 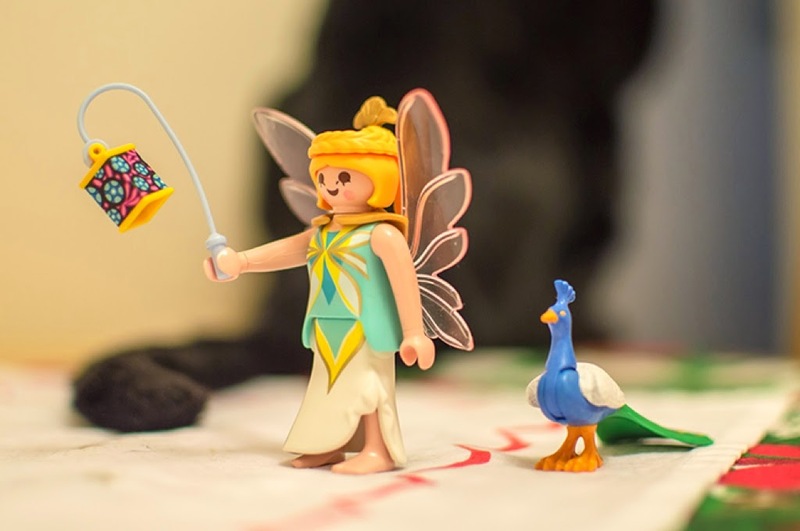 She is in the middle of an advent calendar blog event, so join in and see what she is up to! I've made some necklaces, spoons and flannel dinner napkins. 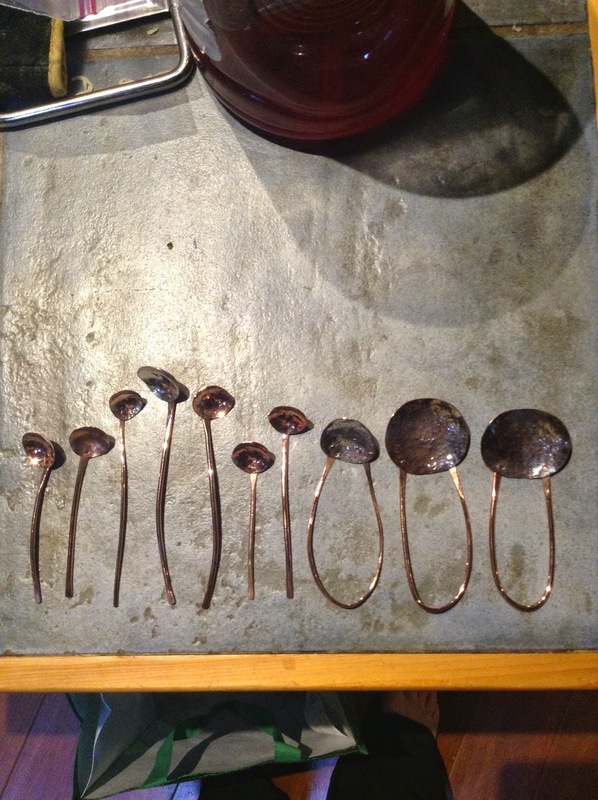 The spoons and pendants are made of rehabbed silver and copper. The photo above shows an example of the texture, the following pics show all of the spoons I have for our booth at the Denman Island Craft Fair. look how that padouk glows! 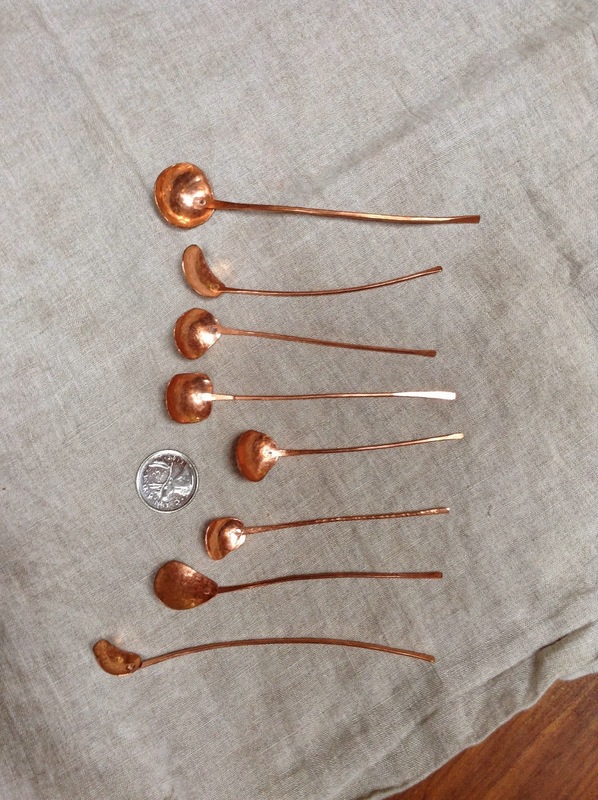 Sorry about the blurry photos, my mojo is going into spoon making now - will work on the photos in due time. 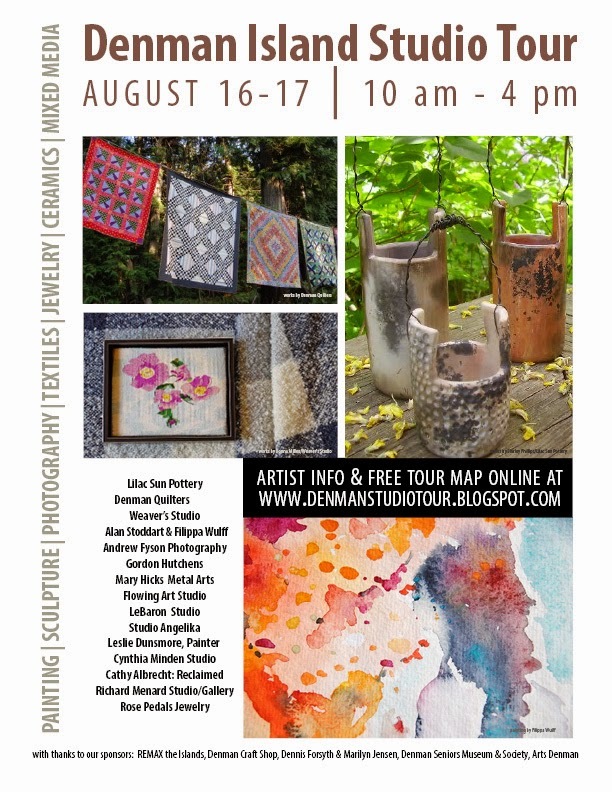 Its time again for the Studio Tour on Denman Island. This year I will be part of the Denman Quilters' display at the beautiful Arts Centre, right in "downtown" Denman. We'll be hanging quilts from trees and porches, there will be tables with displays of work from the quilters group, and the weather will be BEAUTIFUL! 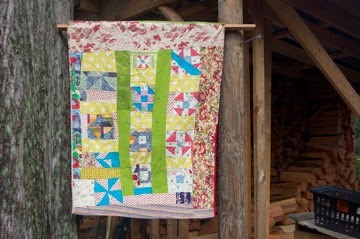 A while back, I made a little log cabin banner or runner in neutral colours. I gave it to Kitty who plays acoustic bass. She was the bass player in the band that played at a big birthday party we had for my mom. My husband played trumpet, Kathy played guitar, clarinet and sang harmonies, Helen sang her heart out, Gary played guitar and sang some too, and they played the swing music of the thirties and forties. It was a lovely event. 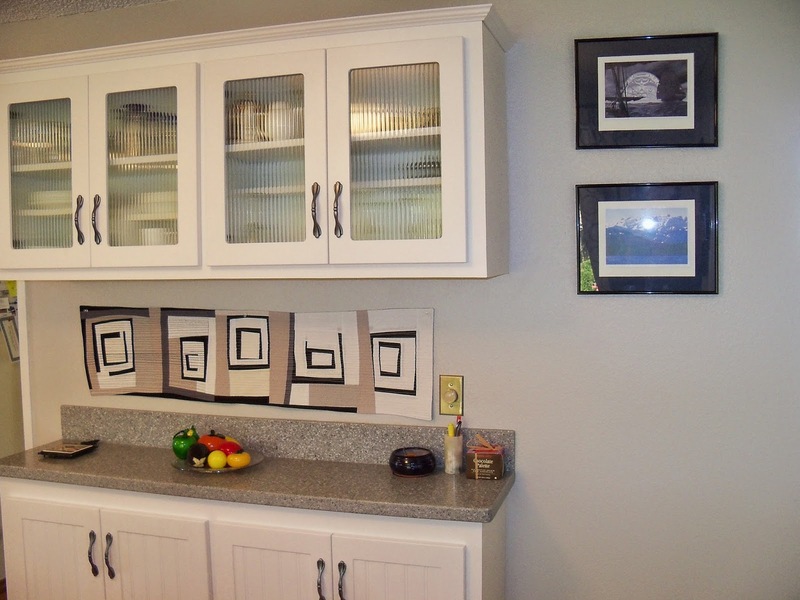 This little quilt was a thank you gift for Kitty, who had just renovated her kitchen. It fit perfectly. The Conspiracy of Fibre Artists! Barb Mortell. Simple theme. Powered by Blogger.